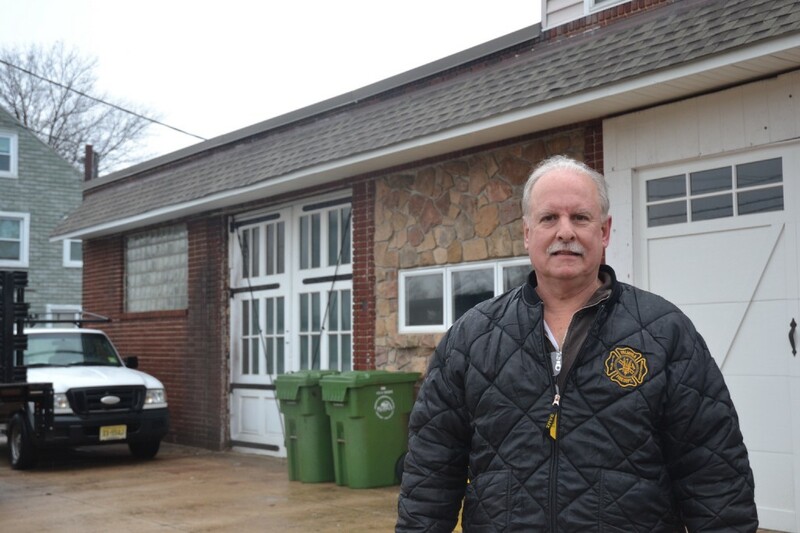 Independence Fire Company historian and life member Matt Gideon stands in front of a building dating back to 1888 that served as a temporary railroad station before becoming a firehouse. An unassuming building that sits at the corner of West Broad Street and Delaware Avenue was built in 1888 as a temporary train station and later served as Palmyra’s second firehouse. “People of this town don’t know it, but that’s an 1888 railroad station,” said Matt Gideon, a life member of Independence Fire Company and the organization’s historian. It’s less than a block away from the current firehouse at 115 W. Broad St., but its story starts at the intersection of Broad Street and Cinnaminson Avenue. Gideon said a portion of the structure, what’s now the second floor, was built by the Pennsylvania Railroad to serve as a temporary station while a permanent brick building was under construction. The railroad company was planning to knock it down after the permanent station was nearing completion in 1889. “It was a perfect opportunity to approach the railroad and buy the temporary railroad station,” Gideon said. The Independence Fire Company was founded in Palmyra not long before the purchase. In 1886, a fire started by an arsonist at a house near 5th Street and Cinnaminson Avenue, spread to Broad Street and destroyed a number of businesses and properties. The event spurred the creation of the fire company. “The people of Palmyra were incensed because they had been after the Cinnaminson Township Committee, the ruling body (at that time), to do something about fire protection,” Gideon said. The fire company soon outgrew its first firehouse, which was basically a shed made of cheap wood, according to Gideon. That’s what prompted the group to buy the railroad station. After submitting a successful bid for the temporary station, the company had it moved from Broad and Cinnaminson to its current location. “They had to modify the front and put double doors on the front,” Gideon said. At the time, the fire company’s apparatus consisted of one hand-drawn hook-and-ladder truck. Later, the fire company bought a hose carriage from the Philadelphia Fire Department and housed it alongside the hook-and-ladder truck side-by-side in the old railroad station. “Once they did that, then they decided they needed a meeting room,” Gideon said. The fire company lifted the old railroad station up and built the ground floor underneath to house the equipment. The top floor became a meeting room for the firefighters. “So this second floor of the old firehouse is actually an original temporary railroad station from 1888,” Gideon said. Eventually, the fire company outgrew the building. In 1956, the company moved into its current firehouse, which used to be an A&P grocery store. Today, the structure is owned by RCR Electrical Contractors. John Robinson, of RCR, said the oldest part of the building remaining is the basement and a set of doors his company reconditioned. Will Valentino, a trustee with the Palmyra Historical and Cultural Society, said he feels it’s a shame the historic building has not been preserved. “You can’t make an old town like this anymore, but you can try to save what remains of the past and celebrate it,” Valentino added.